When I went to BEA with my husband this past year, my main goal was to find great young adult books that his high school students could fall in love with. So when I saw this cute, fluffy romance book set in Paris, I went for it. This is a cute book about two teenagers who go to Paris to reconnect with their dad, who left them just about a year before and who is now marrying another woman in Paris — Sophie and her brother, Eric, are sent to Paris to celebrate the wedding and meet their new stepmom and stepsister. Their stepsister is awful to them, and gets Sophie into all sorts of trouble by playing games and manipulating things. So, it becomes really complicated when Sophie ends up falling for Camille’s friend, Mathieu. Hijinks ensue. 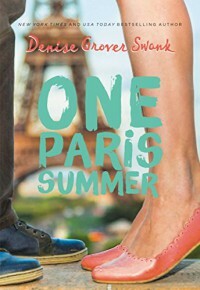 One Paris Summer is pretty much what I was expecting. It’s a fast read and it’s fun. Sophie at first got on my nerves, but it made sense within the context of the story and her character evened out within the first few chapters, thank goodness, so I actually ended up enjoying her character and looking forward to reading about her adventures in Paris. My favorite parts were her interactions with her brother and her crush, Mathieu. It was nice to see Sophie realizing that people didn’t hate her and cared about her. My main problems with a lot of this book had to do with logic and drama. Characters’ reactions to things didn’t seem to fit with their personalities and seemed only to serve the purpose of creating conflict that felt melodramatic and fake. However, aside from that, the romance and Paris aspect were really fun. This is a book you don’t want to think too much about — what I like to think of a beach read. Just breeze through it and enjoy the fun, cute parts. Because of that, this took me very little time to finish once I started focusing on it, and overall, I enjoyed it. I think younger teens would enjoy this a lot, but there isn’t a lot of crossover appeal for older readers simply because what I said earlier about the conflicts feeling overly dramatic. Side note: I loved that we got some French words thrown in here, so readers might be able to learn a couple of phrases. Nice touch!